Rampey said customers will also come into the store with lists items mentioned by Dr. Oz. "He is definitely giving us a run for our money and keeping us busy and on our toes," Rampey said. Fellow employee Susan Ledbetter said the doctor's advice reinforces what Garner promotes to the public. "Garner's is all about nutrition and helping people figure out what they need for their lifestyle," Ledbetter told WYFF. "We've had a lot of these products for a long time, and now people are actually starting to understand what they're for." 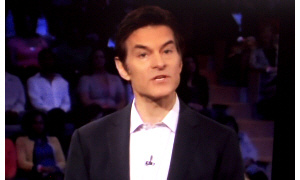 Kim West, a Garner's customer, said she is a recent devotee of "The Dr. Oz Show." "I actually have a pen and paper. I write down notes and I go straight to the store," West said. West said it helps having the information come from a physician. "I don't know if I've come across miracle cures -- just things to help guide me in the right the direction," West said. "I'm sure there will be something that works for me personally." Garner's keeps a list of some of Dr. Oz's recommended items by the register and places many products mentioned by the doctor in a special area. "It's really good for business. It has really brought in a lot of customers that didn't know about Garner's," Ledbetter told WYFF. "It has really kind of reached a broad spectrum of people." Copyright 2012 by WYFF4.com. All rights reserved. This material may not be published, broadcast, rewritten or redistributed.